NEW DELHI: Countries in Asia, including India, continue to grow the captive elephant industry for elephant rides and performances to meet irresponsible tourist demands. A new report released by World Animal Protection reveals that more than three quarters of nearly three thousand elephants used in tourist entertainment in Asia are kept in severely cruel conditions. Riding an elephant is one of the most popular tourist activities in Asia. World Animal Protection investigated the conditions endured by 2,923 elephants at tourist venues in Thailand, Sri Lanka, Nepal, India, Laos and Cambodia and found that 77% of them were treated appallingly. In India 116 elephants continue to endure abuse to entertain tourists at Amer Fort in Rajasthan. Elephants are also widely abused in Kerala in temples and for tourist attraction purposes. Elephants are exploited in national parks and sanctuaries for giving rides to tourists to view wildlife. Most of India’s 3500 captive elephants are used in some form of riding activity. Thailand is the main concern using twice as many elephants in tourism than all the other Asian countries combined. Tourism to Thailand doubled from 15.9 million to 32.6 million visitors between 2010 and 2016, contributing to a 30% rise (1,688 to 2,198) in elephants held in captivity for tourist activities. The research also found that several venues in Thailand cater to thousands of visitors daily, generating estimated profits of tens of thousands of dollars per month from exploiting Asian elephants – an endangered species. When not giving rides or performing, elephants are typically chained day and night, most of the time to chains less than 3m long. They are also fed poor diets, given limited veterinary care and are frequently kept on concrete floors in stressful locations near loud music, roads or visitor groups. These conditions take no account of the elephants’ intelligence, behaviours and needs and follow the severe trauma endured by elephants in their early years. This is caused by separation from their mothers and harsh training regimes to break their spirits and make them submissive enough to give rides and perform. Gajender K Sharma, India Country Director at World Animal Protection, said, “The cruel trend of elephants used for rides and shows is growing – we want tourists to know that many of these elephants are taken from their mothers as babies, forced to endure harsh training and suffer poor living conditions throughout their life. Since 2005, World Animal Protection has been campaigning to improve the welfare of elephants and a study on tourist attitudes in 2017 has seen globally a 9% drop in the number of people who find elephant riding acceptable compared to three years ago. In 2014, World Animal Protection revealed that globally 53% of people felt that riding an elephant was acceptable and 40% found it unacceptable, compared to 2017, when only 44% thought elephant riding was acceptable and 49% found it unacceptable. 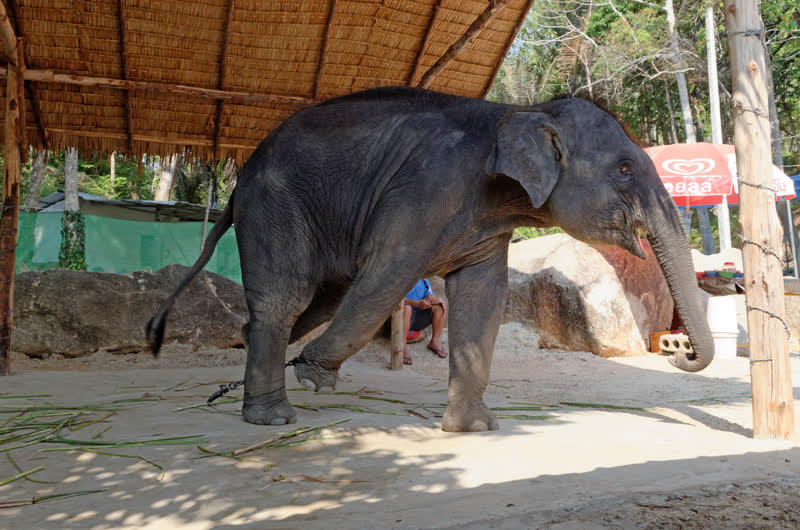 Most tourists sign up for experiences with elephants because they love wild animals and don’t know about the cruelty behind the rides, tricks and photo opportunities–if people knew the facts, then they wouldn’t do it. The best place to see an elephant is in the wild or, in the next best place, a genuine elephant sanctuary. World Animal Protection calls upon the government to phase out elephant rides in wake of the ongoing case at Supreme Court and implement a humane and sustainable solution to ensure that India’s National Heritage Animal is able to live in peace and dignity. This World Animal Protection report documents the conditions endured by nearly 3,000 elephants used in tourist venues across Asia. 220 venues were surveyed between late 2014 and mid-2016, including all venues that could be identified in Thailand, Laos, Cambodia, Nepal and Sri Lanka and a representative selection of venues in India. It follows World Animal Protection’s first survey in 2010 covering the conditions of elephants in entertainment in Thailand, called Wildlife on a Tightrope. To find out more, read World Animal Protection’s report here. Read the full Taken for a Ride – The conditions for elephants used in tourism in Asia report here. There has been a 9% drop in the number of people who find elephant riding acceptable compared with three years ago. In 2014, 53% of those surveyed felt that going on an elephant ride was acceptable and 40% found it unacceptable. In 2017, only 44% thought elephant riding was acceptable and 49% found it unacceptable. More than 80% of people thing that wild animals belong in the wild, and would prefer to see them in this way. A large majority (77% in 2014, 76% in 2017) think that people should not make an income from keeping animals for entertainment if the animals suffer. There is a small increase in the number of people who think that if the only way to see wild animals up close is to see them in captivity, it should not be allowed (44% in 2014, 47% in 2017). Almost two thirds of people disagree that wild animal performance should be preserved if it is part of the local culture, even if it involves animal suffering. There’s a strong expectation (85% in 2014, 83% in 2017) that tour operators should avoid activities that cause suffering for wild animals and around 60% of people would avoid tour operators that failed to live up to this expectation.